As we grow older, we perhaps feel that we have not studied history of India enough or what was portrayed in school text books were a bit skewed ! – yes a history as presented by commies and the British school of thought !! 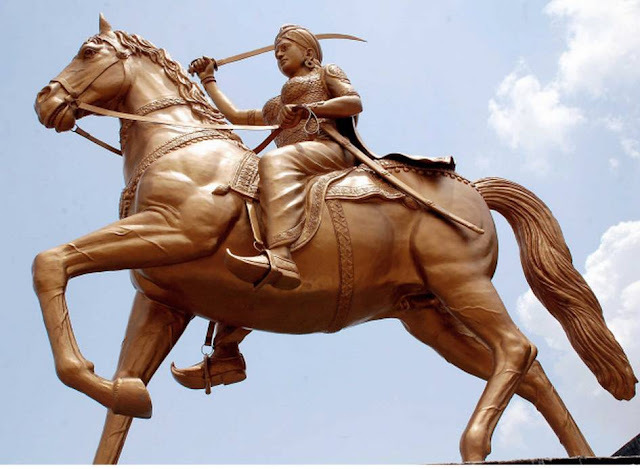 We read about Rani Lakshmi Bai of Jhansi, no doubt a valiant warrior .. .. however, the deeds of Queen Velu Nachiyar perhaps was not documented with the same vigour, as history too lies in the eyes of the beholder. Rani Velu Nachiyar (1730 – 1796), known as Veera mangai, was the queen of Sivaganga and was perhaps the first queen to fight against the British colonial power in India. It is unlikely that one may recognise the Queen depicted riding a horse with a sword installed at Chandupatla village of Nakrekal mandal. History records that Spartan Princess Chilonis, daughter of Leotychidas, wife of Cleonymus and mother of Areus II rose to prominence. Her much older husband Cleonymus was not allowed to succeed to his father's throne because of his violent and tyrannical behaviour, and had spent many years away from Sparta as a soldier of fortune. Chilonis preferred death to a return to her husband; in Plutarch's account of the battle, she kept a rope tied around her neck ready to commit suicide in the case of defeat. Cleopatra II (185 BC – 116 BC) was a queen of Ptolemaic Egypt who ruled from 175 to 116 BC with two successive brother-husbands and her daughter—often in rivalry with her brother Ptolemy VIII. She was sole ruler of Egypt from 131 BC to 127 BC. Her final reign from 124 BC to 116 BC was also spent in coregency with Ptolemy VIII and Cleopatra III. .. .. but you are unlikely to have read in history books this valiant woman ruler of Kakatiya dynasty ! .. One ancient inscription discovered in 1994 suggests that Rudrama Devi died in battle at Chandupatla village on 27 November 1289 though some dispute this .. .. Kakatiya dynasty was a South Indian dynasty with capital at Orugallu, now known as Warangal. The demise of Kakatiya dynasty resulted in confusion and anarchy under alien rulers for sometime, before the Musunuri Nayaksbrought stability to the region. Rudhramadevi (రుద్రమదేవి) released in 2015 was Telugu 3D epic historical fiction film based on the life of Rudrama Devi, prominent ruler of the Kakatiya dynasty in the Deccan, and one of the few ruling queens in Indian history. Anushka Shetty portrayed the title role of Rudrama devi in the film directed by Gunasekhar. Allu Arjun, Rana Daggubati, Vikramjeet Virk, Krishnam Raju, Suman were also featured in this film. The film's soundtrack and background score were composed by Isaignani Ilayaraja. The Tamil version was released by Sri Thenandal films and grossed many a crores .. .. who is this Rudramadevi ? Rani Rudrama Devi was a queen ruler of the Kakatiya dynasty in the Deccan Plateau from 1263 until her death. She was one of the women to rule as monarchs in India .. .. Rudrama Devi probably began her rule of the Kakatiya kingdom jointly with her father, Ganapatideva, as his co-regent, from 1261-62. She assumed full sovereignty in 1263. Unlike her Kakatiya predecessors, she chose to recruit as warriors many people who were not aristocratic, granting them rights over land tax revenue in return for their support. This was a significant change and one that was followed by her successor and also by the later Vijayanagara Empire. Rudrama Devi faced challenges from the Eastern Ganga dynasty and the Yadavas soon after beginning her rule. She was able to repel the former, who retreated beyond the Godavari River in the late 1270s, and she also defeated the Yadavas, who were forced to cede territory in western Andhra. However, she was bogged down by internal dissent posed by the Kayastha chieftain Ambadeva after he became head of his line in 1273. Ambadeva objected to being subordinate to the Kakatiyas and he gained control of much of southwestern Andhra and what is now Guntur District. Rudrama Devi married Virabhadra, a member of the Chalukya dynasty, probably in 1240. Rudrama Devi is believed to have died in 1289 while fighting Ambadeva. She was succeeded by Prataparudra, a son of one of her daughters, who inherited a kingdom that was smaller than it had been when Rudrama Devi had ascended her throne. In the movie version Rudramadevi, Ganapatideva was the emperor of the Kakatiya dynasty who rules Kakatiya Empire from Orugallu(present day Warangal, Telangana) as its Capital. With Kakatiya Dynasty at a problem, Ganapatideva's wife gives birth to a baby girl, but as the Dynasty is in big trouble and the people want a prince, not a princess, the minister advises king to announce the baby girl as a boy. Rudramadevi was formally designated as a son and given the male name Rudradeva. If only history had been recorded properly, in all probability, we would have been commemorating the mourning the death of the Queen this day, way back in 1289. It would not be wrong if we say it a useful information because it really is. The concept is clear after reading this article and i also choose the same idea for Custom Essay Writing Serviceto utilize my skills in effective way and provide others a very unique information. Data is useful and conveys your thoughts very well.